We are proud new patients of Dr. Nottingham. I researched his office prior to my dental exam & I am 200% impressed and pleased to have selected him as my primary care dentist. He by far surpassed my expectations for myself and my man. We both had our consultations at the same time and it was the best thing ever. I enjoyed seeing what we both needed to fix and it gave both him & I something to “Smile” about knowing that we’re both able to share our dental visits together. Boy, we truly learned alot. 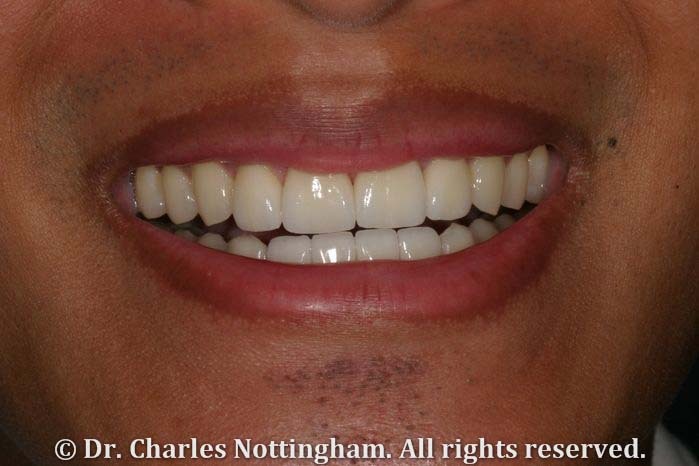 We highly recommend Dr. Nottingham to everyone we know, as a matter of fact I’ve already given out 3 referrals so far. We have no regrets about the care and treatments we’ll receive. We felt good when we left the dental office and his staff is by far the best I’ve known. passion for dentistry. The modern technology and relaxing environment exceeded our expectations. We are sooooo pleased and can’t wait for our cleanings on Tuesday. We can’t believe we’re anticipating going to the dentist together again with back to back appointments. Dr Nottingham that Truly says alot!!! It is such a pleasure to have met you. Treatment Length with Dr. Nottingham: two months.